This tutorial provides you with a foundation for working with Adobe Photoshop filters. It is the eleventh lesson in the Adobe Photoshop CS6 Digital Classroom book. For more Adobe Photoshop training options, visit AGI’s Photoshop Classes. Filters allow you to apply artistic effects to your images. You can make images look as though they were sketched with chalk, drawn with a graphic pen, or even add perspective to them. In this lesson, you will learn how to use filters to apply interesting effects to your images. You will work with several files from the ps11lessons folder in this lesson. Make sure that you have loaded the pslessons folder onto your hard drive from the supplied DVD. See “Loading lesson files” in the Starting up section of this book. Filters are accessed using the Filter menu. When you select certain filters, the Filter Gallery opens. Other filters, when selected, open their own dedicated dialog box. Some, like the Clouds filter, don’t even have a dialog box. Filters are always applied to the layer you currently have selected and cannot be applied to Bitmap mode or indexed color images. Note that some filters, such as Brush Strokes and Sketch, work only in the RGB mode and are not available when working in the CMYK mode. Before starting, you may want to view the file that you are going to create. 1 Choose File > Browse in Bridge. Navigate to the ps11lessons folder and open the file ps1101_done.psd. 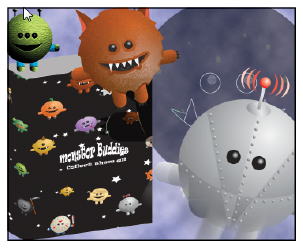 A file including several monsters and a package design appears. 2 You can keep this file open for reference, or choose File > Close to close it. In this lesson, you will use the Clouds filter to build a smoke-like background. The Clouds filter generates a cloud pattern, using random values from the selected foreground and background colors. 1 Choose File > Browse in Bridge, and navigate to the ps11lessons folder and open the file ps1101.psd. 2 Choose File > Save As. In the Save As dialog box, navigate to the ps11lessons folder and type ps1101_work in the File name text field. Choose Photoshop from the format drop-down menu and click Save. 3 If the Layers panel is not visible, select Window > Layers. 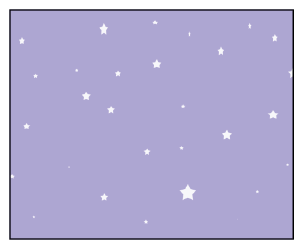 Click on the layer named sky background to activate this layer. 4 Many filters in Photoshop render differently, depending on your current foreground and background colors. Press D on your keyboard to return to the default colors of black and white. Select the sky background layer. 5 At the bottom of the Tools panel, click the foreground color, black. The Color Picker opens. 6 In the RGB text fields, type the values, R: 55, G: 71, B: 92. Then press OK. Your foreground color has been changed. You are now ready to apply the Clouds filter. 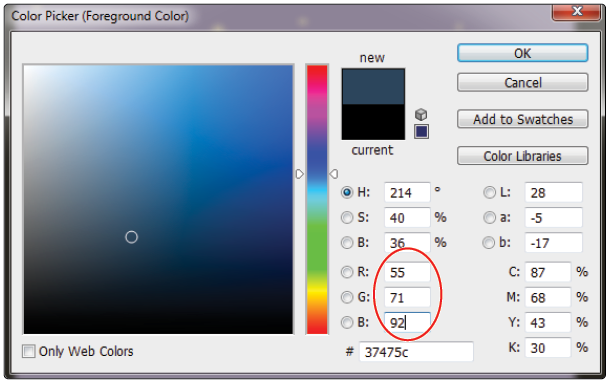 Enter custom values in the Color Picker. 7 Choose Filter > Render > Clouds. A cloud pattern is generated, using random values of the foreground and background colors. Do not save your file, continue to the next part of this lesson. To achieve a more high-contrast effect, press the Shift keys (Windows) or the Option key (Mac OS) while selecting the Clouds filter.